The rhyming book-end shots that open and close Ugetsu—the first shot an out-to-in establishment of a village that hones in on its main characters, the final one a move outward from those who remain to that same village horrifically altered—tidily summarize the intricate formal arrangement of Kenji Mizoguchi’s masterpiece, their inverse compositions and movements indicative of the thorough visual mapping of the entire film. The early shots are almost literally straightforward, with camera setups that view its laterally arranged characters from perpendicular positions. These compositions match the bluntness of the narrative setup: Genjuro (Masayuki Mori), a local potter, sets out with his friend Tobei (Eitaro Ozawa) to sell his wares in neighboring areas as a civil war heats up between rival daimyo. 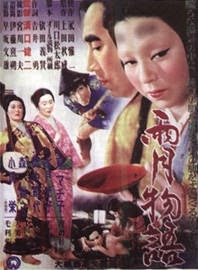 Genjuro’s wife, Miyagi (Kinuyo Tanaka), frets about him going to cities filled with soldiers, but otherwise their lives are tranquil. All That Jazz is a New Hollywood film from an Old Hollywood filmmaker; more than that, it’s a film that so thoroughly ticks off all the aesthetic and tonal properties of the American New Wave that one is left to think that New Hollywood would have been commonplace far earlier but for the intervention of moral censors and artistically conservative studio producers. 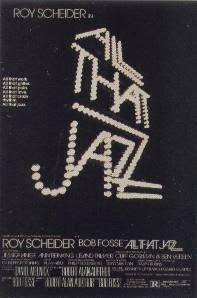 Bob Fosse’s semi-autobiographical film opens with his avatar, Joe Gideon (Roy Scheider), starting his day to a montage of classical music, Alka Seltzer, eyedrops and dexies, a wake-me-up that does not prevent him from lolling in the shower with a soaked cigarette limply dangling from his lips. Red-eyed and weary, Joe nevertheless looks as good as he ever will in this movie, as his increasingly stressful work schedule and the accumulated residue of his hard living start to crush him physically and emotionally. In writing terms, I had a great 2013. I added some cool new bylines to my resumé, and for the first time I even got paid for my work! As such, constantly looming deadlines made me shift focus away from this blog even to update it with links to my work, much less to actually write stuff here. I imagine that will continue in 2014 (at least I hope it does, as it means I'm still pulling down freelance work), but I am still going to try and write a few exclusives here, primarily with my entries in the cross-blog Blind Spots series. I failed to write about five of my chosen picks for 2013, even though I actually watched one of them, French Cancan (a masterpiece I will write about shortly, I hope). So, as to not forget them, I will list them here alongside this year's picks, and with any luck I will get to all of them before the year is done.